Approximately 50% of patients may get a rash with Lyme disease, but only 9% get the classic bull’s eye rash. Symptoms may occur days or months after a tick bite. Rash at other than bite site may be disseminated disease. General Early Lyme disease Symptoms and Signs may include: Erythema Migrans (EM rash), the Bull’s Eye rash (a subset of EM rash), or no rash. The EM rash may appear on other places on your body than the bite site (Disseminated disease). It may begin as a single circular red mark that spreads outwards. As it disseminates over the skin, sometimes it becomes lighter in the area nearer to the center of the bite–this central clearing is what distinguishes a Bull’s eye rash from other EM rashes. In people of color, the rash may appear more like a bruise. The rash is usually not itchy. The rash can be mistaken for a spider bite. According to the Centers for Disease Control & Prevention (CDC) surveillance criteria, an erythema migrans (EM) rash in an endemic area, means Lyme disease. In a non-endemic area, a rash requires a positive test. The CDC criteria are for surveillance purposes, not diagnosis. Studies vary as to how long the tick must be attached in order to transmit Lyme disease. The longer an infected tick is attached, the greater the chance of contracting Lyme disease. 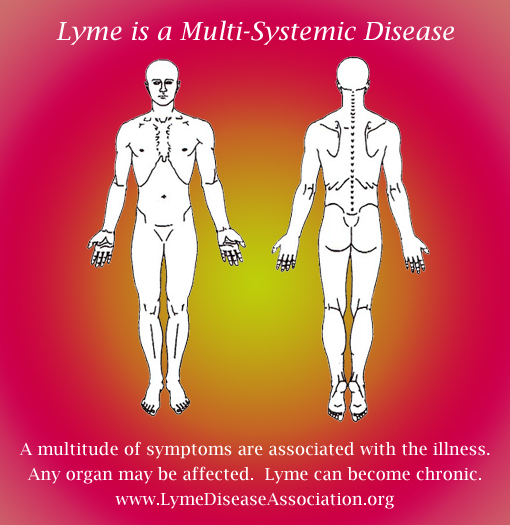 For the full list of symptoms visit the Lyme Disease Association’s Signs and Symptoms List. To see a gallery of EM, Bull’s Eye, and other tick borne disease related rashes go here.